Dr. Kim is a professor at University of California, Irvine. She received her Ed.D. at Harvard University in Human Development and Psychology (with a concentration on Language and Literacy, and a minor concentration on Quantitative Policy Analysis in Education). She holds Master’s degrees in Teaching English to Speakers of Other Languages (TESOL) as well as in Human Development and Culture. She was a former classroom teacher at the primary and secondary schools, and community college in San Francisco, California. Before joining the faculty at UC Irvine she had a joint appointment at the College of Education and the Florida Center for Reading Research at Florida State University. 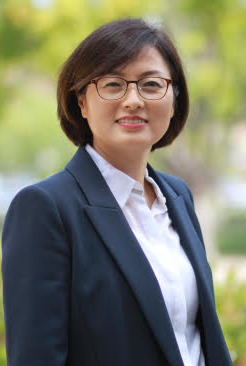 Professor Kim’s primary research areas include development and struggles in language, cognition, reading, and writing acquisition across languages and writing systems as well as effective instructional approaches to promote development in these areas. Her studies have involved students learning different languages and writing systems, multilingual learners, children with reading and writing difficulties, and children from various socio-economic and cultural environments. Dr. Kim’s work has been supported by the Institute of Education Science, U. S. Department of Education, the National Institute of Child Health and Human Development, National Science Foundation, United States Agency for International Development (USAID), and the National Research Foundation of Korea. Dr. Kim received several awards, including the Presidential Early Career Award for Scientists and Engineers (PECASE) by President Barack Obama; and the Developing Scholar Award and University Teaching Award at Florida State University. She currently serves as an associate editor for Journal of Educational Psychology, and editorial board for several journals including Reading Research Quarterly, Reading and Writing, Journal of School Psychology, School Psychology Review, and Educational Researcher. Cho, J.-R., Park, S.-G., & Kim, Y.-S. (2015). Relations of cognitive skills with reading and listening comprehension among Korean children: A 1-year longitudinal study. Information: An International Interdisciplinary Journal, 18, 1975-1982. Kim, Y.-S. G., & Park, Y. H. (2015). Parent-child interactions in bookreading and child’s narrative skills for prekindergartners: Exploring "during" vs. "after" book reading interactions. International Journal of Early Childhood Education, 21, 1-21. Su, X., & Kim, Y.-S. (2014). Semantic radical knowledge and word recognition in Chinese for Chinese-as-foreign language learners. Reading in a Foreign Language, 26 (1), 131-152. Yoo, Y. M., Park, S-G., Kim, Y.-S., Seo, A. (2013). Review of intervention studies for children with learning disabilities in Korea. Journal of Special Education Studies (in Korean), 5, 45-65. Kim, Y.-S., Al Otaiba, S., Puranik, C., Folsom, J. S., Greulich, L., & Wagner, R. K. (2011). Componential skills of beginning writing: An exploratory study. Learning and Individual Differences, 21, 517-525. https://doi.org/10.1016/j.lindif.2011.06.004. Katzir, T., Kim, Y.–S., Wolf, M., O’Brien, B., Kennedy, B., Lovett, M., & Morris, R. (2006). Reading Fluency: The Whole Is More than the Parts. Annals of Dyslexia, 56, 51-82. Kim, Y.-S. G., & Pilcher, H. (2016). What is listening comprehension and what does it take to improve listening comprehension? In R. Schiff & M. Joshi (Eds. ), Handbook of interventions in learning disabilities (pp. 159-174). New York: Springer. Ritchey, K. D., McMaster, K. L., Al Otaiba, S., Puranik, C. S., Kim, Y.-S. G., Parker, D. C., & Ortiz, M. (2015). Indicators of fluency writing in beginning writers. In K. Cummings & Y. Petscher (Eds. ), The fluency construct: Curriculum-based measurement concepts and applications (pp. 21-66). New York: Springer. Ahmed, Y., Kim, Y.-S., & Wagner, R. (2013). Why should we care about literacy models: Models of reading and writing and who they elucidate the connection between reading and writing. B. Miller, P. McCardle, & R. Long (Eds. ), Integrating Reading and WRITING Instruction in the Classroom. Baltimore, MD: Paul H. Brookes Publishing Co.
Puranik, C. S., Wagner, R. K., Kim, Y.-S., & Lopez, D. (2012). Assessing elementary students’ transcription and text generation during written translation: A multivariate approach. In Fayol, M., Alamargot, D., & Berninger, V. (Eds. ), Translation of thought to written text while composing: Advancing theory, knowledge, methods, and applications. New York: Psychology Press. Kim, Y.–S., & Snow, C. E. (2009). Text modification: Enhancing ELLs’ reading comprehension. In E. H. Hiebert (Ed. ), Finding the Right Texts for Beginning and Struggling Readers: Research-Based Solutions (pp. 129-148). New York: Guildford Press. Snow, C. E., & Kim, Y.–S. (2007). Large problem spaces: The challenge of vocabulary for English language learners. In R. K. Wagner, A. Muse, & K. Tannenbaum, (Eds.) Vocabulary acquisition and its implications for reading comprehension (pp. 123-139). New York: Guilford Press. Kim, Y.–S. G. (2017). Systematic and Evidence-based Literacy Instruction. 찬찬히 체계적으로 배우는 읽기 & 쓰기 교육 Seoul, South Korea: Hakjisa [in Korean] This book covers language and literacy acquisition and instruction for children in prekindergarten to elementary grades, based on empirical research across languages. Target audience includes undergraduate and graduate students as well as teachers and parents. A total of 254 pages. Cho, J.-R., Kim, Y.–S. G., & Park, S.-G. (2017). Language and reading assessments in Korean-I. Korea Guidance. [in Korean] This is a standardized and normed assessment on children’s emergent literacy skills (e.g., phonological awareness, morphological awareness, RAN), word reading, and spelling. Piper, B., Dryden-Peterson, S., & Kim, Y.–S. (Eds.) (2006). International education for the millennium: Toward access, equity, and quality. Harvard Education Publishing Group: MA. This report for USAID (United States Agency for International Development) is a comprehensive, systematic survey and review of early literacy acquisition and instruction for children in developing countries. The topics include key areas and skills to promote early grade literacy skills (oral language, reading, and writing), key factors and actors responsible for this (e.g., language of instruction, learning in multilingual contexts; teacher knowledge, education, and parental and community engagements), and long-run considerations (e.g., costs, financing, scaling up, and sustainability). Snow, C. E. & Kim, Y.–S. (2003). Syntactic and discourse structures: What should 4th and 5th graders know and be able to do? Briefing paper prepared for the New Standards Committee on 4th and 5th grade literacy, National Center on Education and the Economy and the University of Pittsburgh.